Despicable Me 2 will be shown on July 3 nationwide. In line with this, McDonald's launched new of set of Happy Meal toys featuring Gru's minions from the movie. 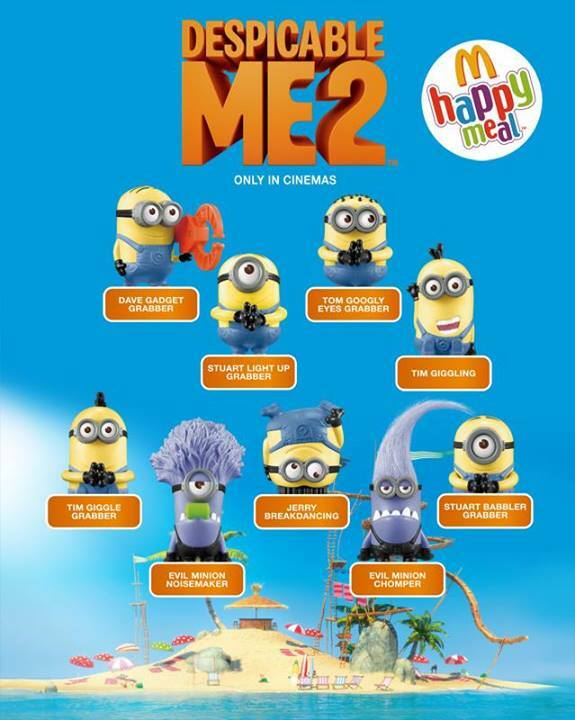 Despicable Me 2 Happy Meal is now available at the nearest McDonald's store with one toy free with every Happy Meal. You can also order the meal thru McDonald's delivery hotline 8MCDO (8-6236). Another good thing is that with every Happy Meal purchased, 50 centavos go to Ronald McDonald House Charities (RMHC) and its programs – Bright Minds Read Program, Bahay Bulilit and Bigay Tulong. If you are a fan of the movie, time to rush to your nearest McDonalds to collect all 9 toys. Despicable Me 2 toys will be available from June 19 - July 23, 2013.